1. Department of General, Abdominal and Transplantation Surgery, Hannover Medical School, Germany. 2. Institute of Pathology, Hannover Medical School, Germany. 3. Core Facility Quality Management & Health Technology Assessment in Transplantation, Integrated Research and Treatment Center-Transplantation (IFB-Tx), Hannover Medical School, Germany. Background: Adhesions to intraperitoneally implanted meshes (IPOM) are a common problem following hernia surgery and may cause severe complications. Recently, we showed that missing peritoneal coverage of the intestine is a decisive factor for adhesion formation and 4DryField® PH (4DF) gel significantly prevents intestine-to-mesh adhesions even with use of uncoated Ultrapro® polypropylene mesh (UPM). The present study investigates adhesion prevention capability of coated Parietex® mesh (PTM) and Proceed® mesh (PCM) in comparison to 4DF treated UPM. Methods: 20 rats were randomized into two groups. A 1.5 x 2 cm patch of PTM or PCM was attached to the abdominal wall and the cecum was depleted from peritoneum by abrasion. After seven days incidence of intestine-to-mesh adhesions was evaluated using Lauder and Hoffmann adhesion scores. Histological specimens were evaluated; statistics were performed using student's t-test. The data were compared with recently published data of 4DF treated uncoated UPM. Results: Use of PTM or PCM did not significantly diminish development of intestine-to-mesh adhesions (adhesion reduction rate PTM: 29%, p = 0.069 and PCM: 25%, p = 0.078). Histological results confirmed macroscopic finding of agglutination of intestine and abdominal wall with the mesh in between. Compared to these data, the use of UPM combined with 4DF gel reveals significantly better adhesion prevention capability (p < 0.0001) as shown in earlier studies. However, in clinical situation interindividual differences in adhesion induction mechanisms cannot be excluded by this experimental approach as healing responses towards the different materials might vary. Conclusion: This study shows that in case of impaired intestinal peritoneum coated PTM and PCM do not provide significant adhesion prevention. In contrast, use of UPM combined with 4DF gel achieved a significant reduction of adhesions. Hence, in case of injury of the visceral peritoneum, application of a polysaccharide barrier device such as 4DF gel might be considered more effective in reducing intestine-to-mesh adhesions than coated mesh devices. Keywords: hernia mesh rat model, adhesion prevention, Parietex®, Proceed®, 4DryField® PH. Adhesion formation can be a severe problem following hernia repair with intraperitoneally implanted meshes (IPOM). Depending on the operation technique and the type of mesh, postoperative adhesion formation is reported in up to 80% or more of patients 1, 2. Adhesions of intraabdominal organs to the mesh may lead to complications such as chronic abdominal pain 3, 4, bowel obstruction or incarceration 4-7, enterocutaneous fistulas 5, 8, 9 or female infertility 10, 11. To reduce the incidence of adhesion formation, IPOM with coatings for adhesion prevention have been introduced 12-16. Two of the most commonly used coated meshes are Parietex® (PTM; Medtronic, Ireland) and Proceed® (PCM; Ethicon, USA). PTM is a polyester mesh with a collagen coating, PCM a polydioxanone polymer-encapsulated polypropylene mesh with an oxidized cellulose coating 17. Both meshes are implanted with the coated side directed towards the intestine to prevent intestine-to-mesh adhesions, while the uncoated side is directed towards the abdominal wall to allow mesh ingrowth. 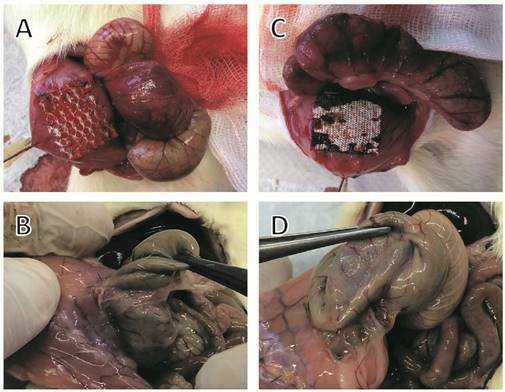 Recently, we introduced a new rat model mimicking clinical IPOM situation with a direct contact of the mesh to impaired intestinal peritoneum, as found in the center of a hernia sac in terms of a hernia operation 18. Using this challenging model it could be shown that the application of a barrier gel basing on the polysaccharide 4DryField® PH (4DF; PlantTec Medical GmbH, Germany), even with use of uncoated Ultrapro® polypropylene mesh (UPM), significantly reduced adhesion formation 19. The present study uses this model to analyse whether the composite approach of coating as exemplified by PTM and PCM is equally efficient in preventing adhesion formation in the presence of impaired intestinal peritoneum. This study was approved by The Lower Saxony State Office for Consumer Protection and Food Safety (LAVES, Hannover, Germany; approval code 13/1095). All experiments were performed at the Zentrales Tierlabor of Hanover Medical School (MHH, Hanover, Germany). In order to provide and assure adequate life quality of the laboratory animals all protocols were conducted in accordance with national and European animal protection laws. A total of 20 male Lewis rats, weighing 351-392 g (mean 370 g ± 13 g) were included in this study. Rats had continuous access to fresh water and ad libitum food availability. Animals' welfare was assessed by monitoring of weight and behavioural changes with a standard observation chart (body condition scoring, GV-SOLAS, Charité - Universitätsmedizin Berlin, Germany). In the present study our recently described rat model was used 18. General anaesthesia was achieved by intraperitoneal injection of 80 mg/kg body weight ketamine and 5 mg/kg xylazine. The required level of narcosis for surgery was stated when flexor reflexes failed to appear. For laparotomic access to the abdominal cavity the abdomen was shaved and sanitized before a 3 cm long median laparotomy was performed. Prior to the surgical intervention, rats were separated into two groups: in one group a 1.5 x 2 cm PTM patch and in the other group a 1.5 x 2 cm PCM patch was implanted at the lateral side of the abdominal wall. Implantation was performed according to the instructions for use of the respective product, i.e. the coated side of the corresponding mesh was implanted towards the intestinal peritoneum. Additionally, the cecal visceral peritoneum was removed by abrasion with dry gauze until petechial hemorrhages over a 1 x 2 cm area were visible. Furthermore, a meso-suture between the cecum and the abdominal side wall with the implanted mesh assured approximation of mesh and abraded cecum. Subsequently, the abdomen was closed using a two-layer closure technique and a consecutive suture. To treat postoperative pain animals received metamizole subcutaneously after surgery with 200 mg/kg body weight and subsequently during the experiment by mixing 40 droplets (= 1 g) to 500 mL drinking water. All animals were sacrificed on day 7 after mesh implantation by carbon dioxide narcosis followed by cervical dislocation. Immediately afterwards, the peritoneal cavity was re-entered via an incision remote to the former laparotomy scar for evaluation of mesh adhesions. Cecum and the part of the abdominal wall with mesh integrated were harvested for histopathological assessment following a standard protocol. On day 7 after initial surgery the abdomen was re-entered and the mesh surface was evaluated for adhesion formation by two independent observers according to scoring schemes by Lauder et al. 20 and Hoffmann et al. 21. The Lauder scoring scheme takes into account number, strength, and distribution of adhesions with the following adhesion scoring: 0; no adhesions, 1; thin filmy adhesions, 2; more than one thin adhesion, 3; thick adhesions with focal point, 4; thick adhesions with planar attachment, 5; very thick vascularised adhesions or more than one planar adhesion. The Hoffmann scoring scheme covers three different aspects: 1) the area of adhesion formation, graded 0 to 4 (0; no adhesions, 1; cecum to bowl adhesion, 2; cecum to sidewall adhesion over less than 25% of the abraded surface area, 3; cecum to sidewall adhesion between 25% and 50% of the abraded surface area, 4; cecum to sidewall adhesion over 50% of the abraded surface area); 2) the strength, graded 0 to 3 (0; no adhesion, 1; gentle traction required to break adhesion, 2; traction required to break adhesion); 3) the extent, also graded 0 to 3 (0; no adhesion, 1; filmy adhesion, 2; vascularized adhesion, 3; opaque or cohesive adhesion). These three subscores were summed for a total Hoffmann adhesion score. Hoffmann gross and Lauder scores were set against the corresponding score of controls expressed in percentages. Values were averaged and then subtracted from 100 to allow expression as reduction rate. That means if there was no adhesion formation the adhesion reduction rate was 100%. Photographs of the affected areas were taken from each animal for documentation purposes (20.0 megapixel digital camera, Cyber-shot DSC-RX100, Sony, Germany). Recently published data of 10 rats using the same testing conditions but UPM without anti-adhesive treatment were used as a control (CT) group 18, data of 20 rats using the same testing conditions but UPM combined with 4DF gel for adhesion prevention were used for further comparison 19. Samples were excised en bloc, rinsed and immersed in 4% buffered formalin. Specimens were embedded in paraffin blocks. Serial sections were stained with haematoxylin and eosin or with a PAS staining kit and evaluated by light microscopy in a blinded fashion. Statistical analyses were performed using GraphPad PRISM software (Version 6 for Mac OS, GraphPad Software, Inc., La Jolly, USA). Differences in mean adhesion scores were evaluated using student's t-test. Significance levels were set to p < 0.05. A total of 20 animals completed the study, none had to be sacrificed during the experiment. All animals showed equitable viability and course of body weight (mean loss of body weight on day 7 was 30.6 ± 11.9 g). Table 1 shows the adhesion scores of all groups following Lauder and Hoffmann scoring schemes expressed as a percentage. Original and mean adhesion scores of all animals of the present study can be found in Table 2. Due to the lack of significant differences between both scoring systems, a mean Lauder-Hoffmann score was calculated. This score was expressed as an adhesion reduction rate, based on the results of the control group (UPM without any anti-adhesive treatment). Mean Lauder and total Hoffmann scores, combined mean of both scores, adhesion reduction rate and p-value as compared to control (CT). Original Lauder and Hoffmann, as well as mean Lauder-Hoffmann scores of all animals. Numbering of animals continued from 18 and 19. In comparison with controls (UPM without anti-adhesive treatment), animals with PTM or PCM showed no significantly reduced adhesion scores. Animals in the PTM group had an overall mean adhesion score of 65% (p = 0.069 as compared to controls), equivalent to an adhesion reduction rate of 29%. In this group dense agglutinations were detected in 6 rats (85%; 90%; 90%; 90%; 90%; 90%, Fig. 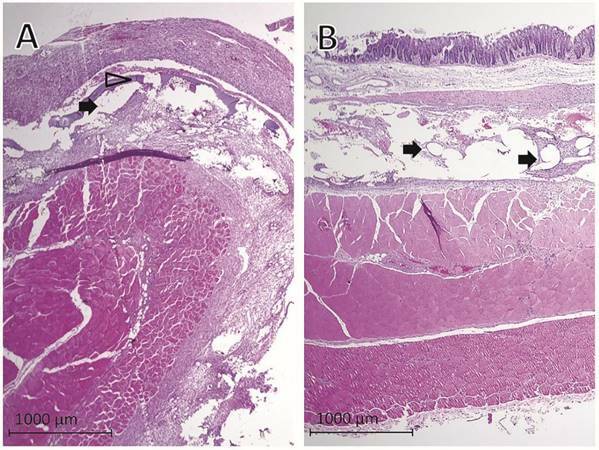 1B), medium adhesions developed in 2 rats (40%; 50%) and minor adhesions also in 2 rats (10% each). In animals with PCM implantation, an overall mean adhesion score of 69% (p = 0.078 as compared to controls), equivalent to an adhesion reduction rate of 25%, was observed. In this group dense agglutinations between cecum and PCM were visible in 5 rats (90% each, Fig. 1D), medium adhesions in 4 rats (50%; 55%; 55%; 65%), and minor adhesions in 1 rat (10%). As described recently 19, animals with UPM implantation and anti-adhesive treatment with 4DF gel had significantly lower adhesion scores as compared to controls (p < 0.0001) (Fig. 2). 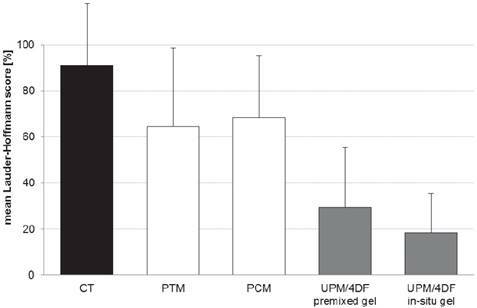 A comparison with the adhesion scores of already coated devices used in the present study revealed a significantly better adhesion prevention capability of UPM combined with 4DF gel (Table 1 and Fig. 2). Evaluation of histological findings showed that PTM (Fig. 3A) and PCM (Fig. 3B) fibers were surrounded by granulating tissue connecting the abdominal wall, the implanted mesh and the cecum. Remnants of the collagen coating of PTM were visible as a thin layer within the granulating tissue (Fig. 3A). The histologic examination confirmed the macroscopic adhesion scoring in extent and severity of adhesion formation between the abraded cecum and the mesh. Representative photographs of implanted meshes, cecal abrasion and meso-stich approximation on day 0 (A and C). Dense agglutinations on postoperative day 7 (B and D). (A and B) Parietex®, (C and D) Proceed®. Comparison of mean adhesion scores of intestine-to-mesh adhesions: control (CT; uncoated mesh without anti-adhesive treatment), Parietex® mesh (PTM), Proceed® mesh (PCM), uncoated Ultrapro® mesh combined with 4DryField® PH premixed gel (UPM/4DF premixed gel), and uncoated Ultrapro® mesh combined with 4DryField® PH in-situ gel (UPM/4DF in-situ gel). Original data of CT published in 18, original data of UPM/4DF premixed gel and UPM/4DF in-situ gel in 19. Representative histological findings one week after mesh implantation in rats with cecal abrasion with (A) Parietex® and (B) Proceed® meshes. Black arrows = mesh fibers, hollow arrowhead = remnants of collagen coating of Parietex® mesh visible as a thin layer within granulating tissue. Intestinal adhesions to intraperitoneally implanted mesh materials (IPOM) are still a problem and may cause chronic pain, bowel obstruction or enterocutaneous fistulas, possibly followed by infection 22. Furthermore, adhesions can be associated with secondary female infertility 4, 10, 11 and complicated re-operations 5, 8, 23, 24. In the long run, these adhesions can lead to an impairment of the stability and flexibility of the mesh 15. Recent studies showed that not only the foreign material or making of mesh but also the impairment of visceral peritoneum is a co-decisive factor for the development of intestine-to-mesh adhesions 18, 25, 26. This especially accounts for areas where intestine has been dissected from the hernia sac. Here, unavoidably an intact peritoneal coverage is missing. Our recently introduced rat model, comprising the placement of mesh on intact peritoneum and the secure exposition of mesh towards injured intestine, combines two challenges of IPOM surgery: (1) integration of the implanted mesh into the abdominal wall, (2) coping with the trigger for adhesion formation originating from injury of intestinal peritoneum. In Parietex® (PTM) and Proceed® (PCM) the synthetic mesh material is coated with an anti-adhesive layer on the visceral side, while on the parietal side plastic is directly exposed to the abdominal wall. The purpose is to allow unhindered integration into the abdominal wall, while the temporary coating is supposed to prevent formation of adhesions. Coating of PTM consists of collagen, PCM uses oxidized cellulose for coverage. The results of the present study indicate that integration into the abdominal wall occurred unhindered and was not negatively affected by the anti-adhesive coverage, even though after one week still remnants of the anti-adhesive coating were visible. With respect to adhesion prevention, a significant efficiency could not be found. The presence of remnants of the anti-adhesive coverage in PTM animals possibly suggests limited efficiency of the coating material. Agglutination and absence of coating material in PCM animals may indicate that the coating material might have been degraded before a neo-mesothelial layer on the cecum could develop. The more favourable experimental results of PTM and PCM found in the literature 27-30 can be explained by a different experimental approach, in which the visceral peritoneum was left intact. However, the model of the present study with injury of intestinal peritoneum mimics clinical practice, as found commonly, where effective adhesion prevention is desired. The results of our recent study, in which a barrier gel was applied between injured intestine and mesh 19, deserve special consideration. In this approach the adhesion prevention device is not limited as a coating layer to singular mesh fibers, leaving unprotected gaps between the fibers. Instead, the 4DF gel barrier covers the complete area at high risk for adhesion formation so that no gaps are left, in which de-peritonealized bowel could get in contact to the parietal peritoneum. Transferred to clinical IPOM surgery, it could be useful to administer the barrier gel in a selective way, i.e. especially to areas where an intact peritoneal coverage is missing. However, in clinical situation interindividual differences in adhesion induction mechanisms cannot be excluded by this experimental approach as healing responses towards the different materials might vary. Our results indicate that in case of impaired intestinal peritoneum coated Parietex® and Proceed® meshes do not provide significant adhesion prevention. Considering the superior outcome of 4DryField® PH gel applied between injured intestine and uncoated polypropylene Ultrapro® mesh, the use of a polysaccharide barrier device as a prevention for adhesions can be acknowledged a promising alternative to coated mesh technology in IPOM surgery. Corresponding author: Dr. Daniel Poehnert, PhD, Carl-Neuberg-Strasse 1, D-30625 Hannover (Germany). Tel. +49 511 5326534 Fax +49 511 5324010 E-Mail poehnert.danielde.